I have mentioned in the past that my husband plays baseball. For US readers that may not sound unusual, but here in Australia, baseball isn't really a very popular sport. Over the recent summer, the Australian Baseball League, backed by MLB, started up again. 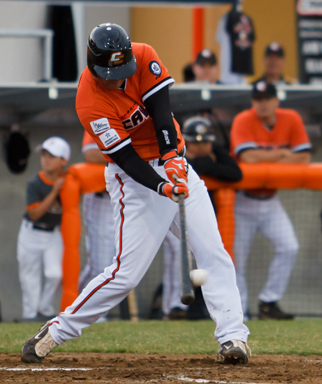 There are six teams in the national comp, and despite his age (not that I'm calling you old honey) my husband managed to get quite a few games in with the Canberra Cavalry. I recently found an e-tailer that could create custom nail art water decals. I was really excited to see the baseball ones, so ordered a whole stack with the team and player name. With water decals, they really only work on very light coloured nails. This is because the water decals are clear and they can't print in white ink. 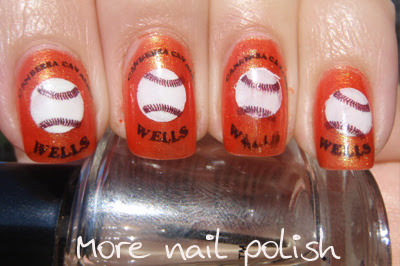 Because orange baseballs would look stupid, I wanted to get neat white circles on my nails. So what I did was paint my nails orange (team colour), using Ulta 3 Crazy. I then used a hole punch to punch a circle in some scotch tape. I put the scotch tape on my nail and painted the hole with white polish. Then very carefully, I applied the water decal. I found the decals really hard to work with compared to other ones I have used. If the decal came off the backing paper, it would all crumple up and couldn't be used, I had to carefully slide them off the paper onto the nail. They also were really hard to move around on the nail. Once placed down they were stuck there. Other water decals I've used you have a bit of time while your nail is still wet to position it better. I also discovered that top coat would smudge the ink (as can be seen on the ring finger). So while not great, the positioning is off and the ink is smudged, I did learn a heap applying these for the first time. Come next season I will be the supporter with the fanciest nails! I'm sure that will make all the difference!! And now, just to embarrass him on my polish blog, here is a pick of him playing. Wow, the baseball decals are really cute! But fyi, there are water decals out there which are white (versus transparent), so you can create decals that are opaque white instead of having to paint on the white base yourself. Thanks Cheryl - you reminded me to go back and check your blog for answers to my questions about your homemade water decals. I think I will try some transparant ones, as I like the flexibility of being able to see through to the polish below. Thanks for the info on your blog! No problem! Anyway you can always get a mix of different types of decals off ebay, so you can make them as you like. But I don't foresee myself using up the decals fast. One A4 sheet makes a few hundred, so that's going to take me ages to finish! I want to say that I love your Blog header A LOT. And very cute nails too!